With Arthur Chu’s quarterfinal in the can, we now turn our attention to Julia Collins. Will Joshua Brakhage and Jim Coury come out swinging? Be sure to check out my preview of this game. Before we begin, I want to show the detail of the shirt I wear in the video. Julia had mentioned she’d be making shirts for family and friends who made the trip to the TOC taping, and there were over a dozen of these in the audience. 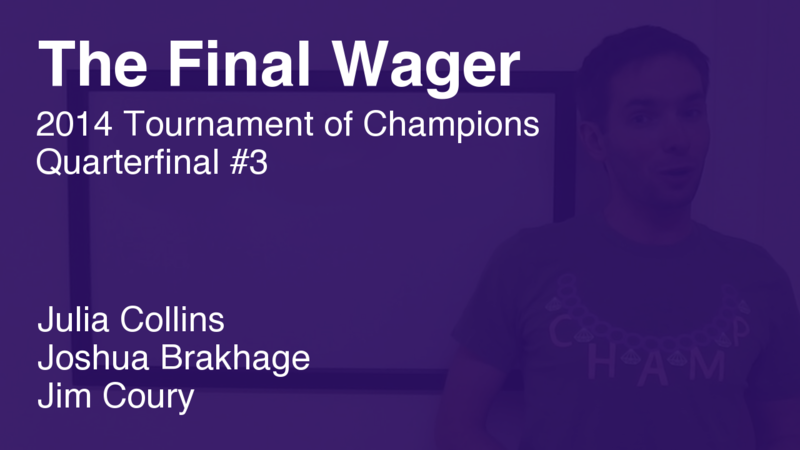 All right – let’s look at wagers. First off, Jim should wager everything. Julia should wager 7,001 to cover Joshua. 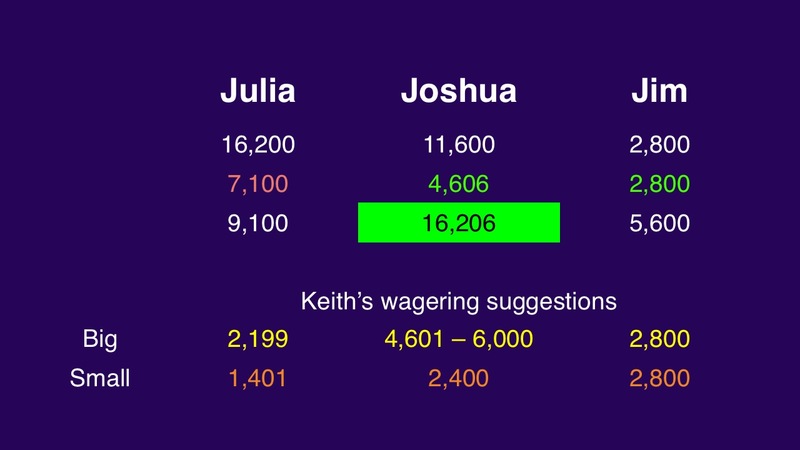 Joshua can wager up to 2,400 to stay above Julia if they’re both wrong and she goes big. Joshua can wager up to 6,000 to remain at or above Jim’s final total. Joshua should wager at least 4,601 to cover a zero wager by Julia. If Joshua wagers 2,400, his total will be 14,000. 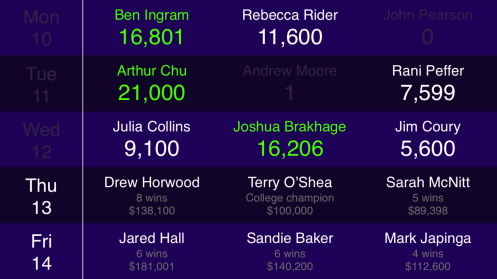 In response, Julia might cap her wager at 2,199. Or, if she thinks Joshua might wager 6,000, she could wager 1,401. So Julia goes big, and in doing so, falls to a vulnerable second position on our wild-card leaderboard. Apparently, she didn’t think 16,200 was good enough for a wild card. She has evidence: there have been several times when the wild-card cutoff was above this score. Overall, however, the trend has been down ever since dollar values were doubled in 2001. Tomorrow’s match pits 8-timer Drew Horwood against College Champ Terry O’Shea and 5-timer Sarah McNitt. Here’s a preview. Still think that any wager at all for Julia was a mistake. $16,200 is practically a lock into the semis. She is in a very dangerous position at $9100. She lucked out. She shouldn’t have wagered anything. Maybe $1000, tops.